[News update]If you own a home north of Toronto, you’d better sit down. Condo prices per square foot in the Vancouver city centre have soared 40 per cent over the past year, according to a survey from Century 21 Canada. A new study from realtor Century 21 breaks down house prices in Canada per square foot and it shows tremendous price increase. 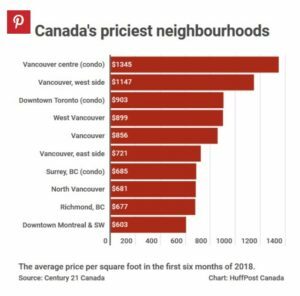 “Trends in real estate prices per square foot have been fickle for the last year —soft in some cities but stable in others, even varying from suburb to suburb in some cases,” Century 21 Canada said in its report. “The trend of fluctuating prices has very likely only increased further since our cut-off for data earlier this summer,” executive vice-president Brian Rushton said. While Vancouver’s housing market went into serious slowdown mode over the course of this year, condo prices in the city’s downtown core have soared, up by nearly 40 per cent in a year, Century 21’s survey found. downtown Vancouver the most expensive real estate market in Canada, at $1,345 per square foot. Similarly, downtown Toronto, where condo prices jumped 10.3 per cent in a year. At $903 per square foot, a minuscule 400-square-foot studio apartment will now run you around $360,000. crown for most volatile housing market goes to Peterborough, Ont., where house prices have fallen by about 24 per cent on a per-square-foot basis in the past year. At the same time, condo prices there soared by 24 per cent. The city makes the list of top 10 fastest-growing house prices and the list of fastest-falling prices. With house prices more than doubling in the Toronto and Vancouver regions over the past decade, the disparity in wealth created by real estate is becoming truly breathtaking. Case in point: For the price of a downtown Vancouver property, you could buy 13 or 14 homes of equivalent size in Moncton, N.B., the country’s least expensive housing market. That’s basically your own neighbourhood. You know, for when friends and family visit.